One of the hottest newcomers in the Swiss Rock-/ Metal scene. Frozenroom is a new unsigned Swiss band from Canton Basel-Country. 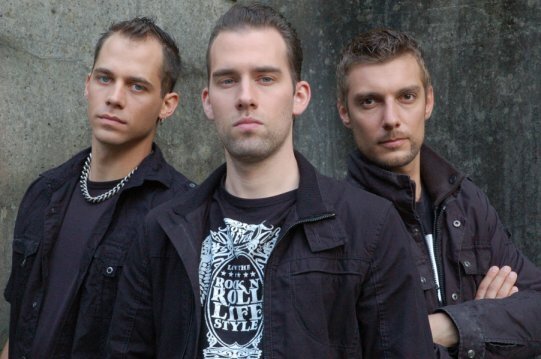 They got founded by singer and bass player Alain Schwaller, guitar player Chris Furrer and drummer Boris de Roche. The band name might not suit for the degrees in Switzerland, but it’s an allusion to the deep tunes in their music. What can you expect from this band? A powerful mixture of Rock music and Metal with influences from Creed, Alice in Chains and Black Label Society. Their first song “Drown” starts with catchy guitar tunes and pulls down the gas pedal. Singer Alain Schwaller shows his powerful vocal skills at the chorus and kicks the bass during guitar player Chris Furrer accompanies him. “21 Grams” is slower compared to “Drown” but not less interesting. Alain Schwaller shows a new facet of his vocal skills with deep vocal tunes and Chris Furrer rocks the track with his powerful guitar tunes. This song has an Alice in Chains touch and reminds me a little bit of Layne Stayley. “You Don’t See” sound a little bit like Soilwork in the beginning. You can’t deny the Metal influence and a whiff of Alice in Chains shines through the track. It’s a great up tempo song where you can not stay sitting in your chair! I think this song could become a hit if Frozenroom would release it as a single. Personal for me, this song has the potential, because Frozenroom show their strength in melodies and chorus. Furthermore, this own production got a powerful production and a great mix. These are two acoustical properties, which decide about life and death and not many unsigned bands have them in their productions today. In my opinion, Frozenroom are one of the hottest newcomers in the Swiss Rock-/ Metal scene and I hope that they can convince the crowd and the press with their first full-length album. They announced a record studio visit on their official website. They did a first right step in the right direction. Go on fellas. He is based in Switzerland.